I noticed a brand new mini-Target just off the University of Texas campus. It’s a shrunken version of the big box suburban retailer, located on the first floor of the moribund Dobie Mall. I’ve heard about these new urban focused smaller stores and decided to take a look. The store wisely focused on necessities for college kids with some clothing, household goods and even a mini grocery store. I could see it being really handy for people in the area, especially without a car. The rest of the mall appears to be under renovation, though the second floor food court still looks barren. I was attracted to this decidedly University of Texas centric display. 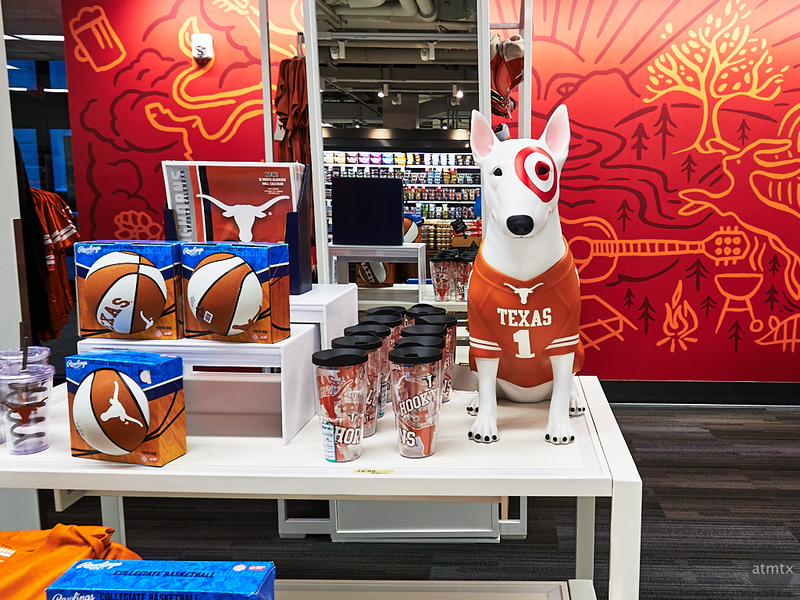 What made it particularly amusing is the Target Dog mascot wearing a UT shirt. Believe it or not, this isn’t the first time I shot photos in a Target. For being a discount retailer, they have a good sense of design and I sometimes like to document the graphically attractive. I’ve also taken pictures of my boys with the store as a backdrop. Odd you say? Well, documenting these casual, everyday life scene with my kids are some of my favorite pictures. Sure the Disneyland castle in the background makes for a nice tourist pic, but real life happens in a Target or a HEB Supermarket. I used the Canon G7X Mark II, of course, since that’s what I’ve showcased for the last week or so. What I haven’t mentioned before is that documenting casual life is one of my main reasons for buying this camera. Sure, the G7X Mark II might do a pretty decent job shooting street scenes at night, but I can easily use my Olympus for that, with even better results. It’s the awkward or everyday places where I can bring a small camera, which makes these compact cameras truly worthwhile.